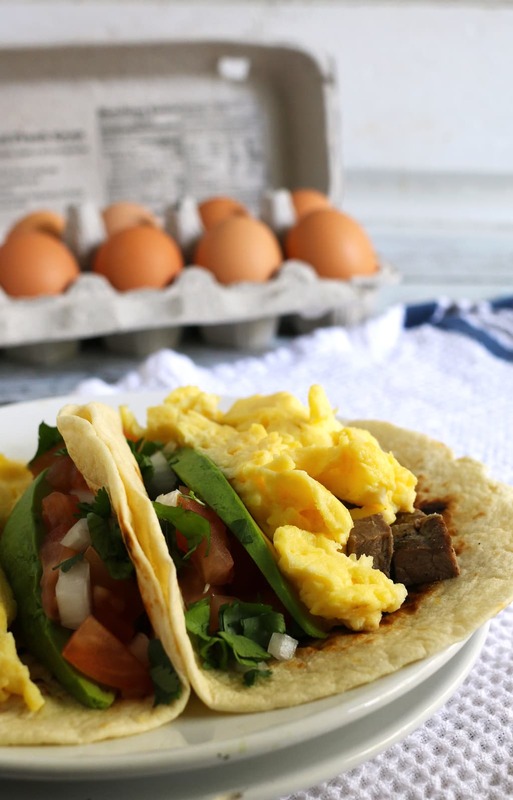 Steak and egg breakfast tacos are a great spin on a traditional diner breakfast. Add your favorite taco toppings! Also great for Father’s Day morning and steak lovers! Thank you to Phil’s Fresh Eggs for sponsoring today’s conversation. My love of their cage-free eggs and all opinions are my own. Happy National Egg Day! I usually start my day with eggs but because of today’s special occasion, I’m celebrating. Today we are having steak and egg breakfast tacos and I think you should too! As part of my partnership with Phil’s Fresh Eggs, I am using their eggs to make my breakfast tacos today. Phil’s has offered cage-free eggs since 1959 – they were one of the first pioneers in providing cage-free eggs. 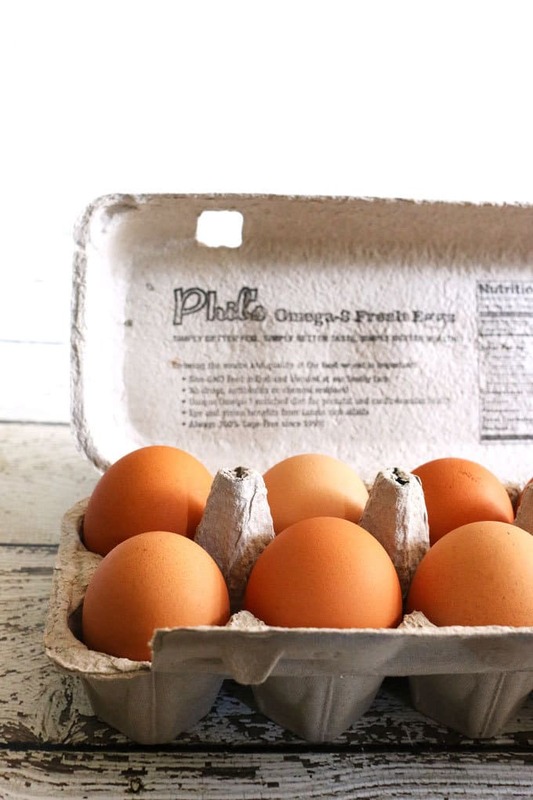 Phil’s eggs are known for their deep yellowy orange yolks, which is a result of the chicken’s diet of corn, soybeans and omega-3 rich ingredients (all sourced from Midwestern farms, I might add!) Their eggs are PERFECT for scrambled eggs – I just love how bright they are. 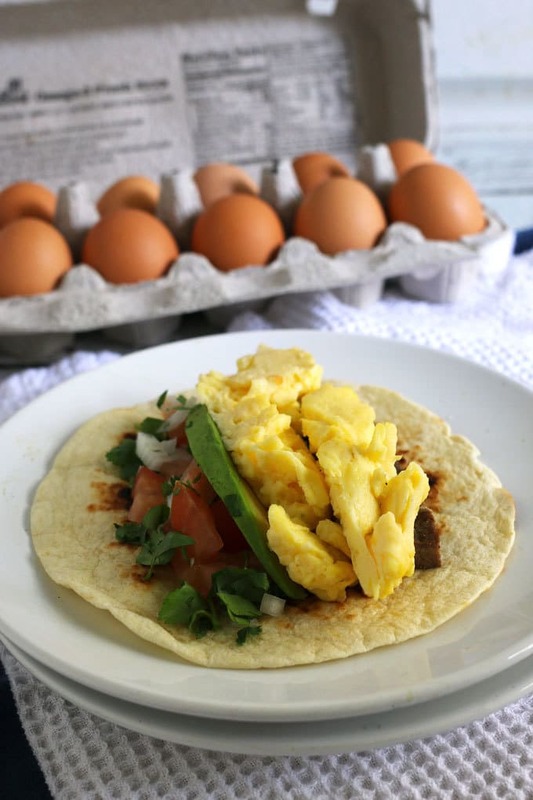 This breakfast taco recipe is great for using up leftover steak from last night’s dinner. If you don’t have leftovers, you can fry up a small steak in the morning while you are cooking your eggs. To scramble my eggs, I always add water instead of milk. I think it makes the scrambled eggs super fluffy and doesn’t take away from the yellow-orange color (like milk would). Cook them low and slow and be careful not to overcook them! My favorite toppings for breakfast toppings are diced white onions, cilantro, avocado and tomato. I think the focus should really be on the steak and eggs so I don’t put cheese on these tacos. 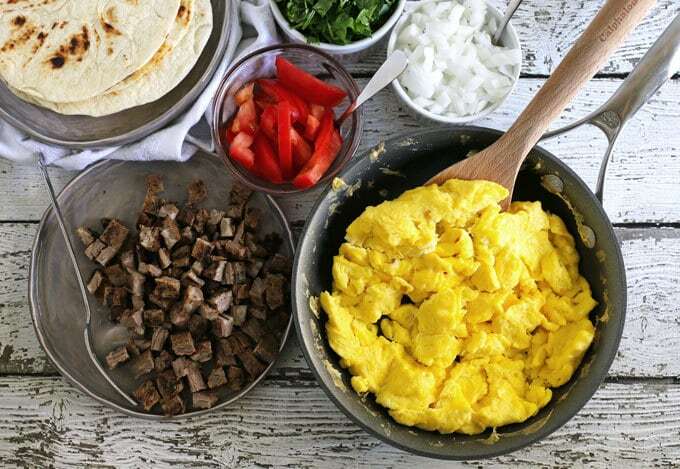 Thinking ahead, steak and egg breakfast tacos would also be a great breakfast for Father’s Day. If your dad (or if you’re a dad) and steak and eggs is your favorite diner breakfast, check out this easy recipe. It’d be great for the morning of every holiday! Heat 1 tablespoon butter in a large frying pan over medium-low heat. Crack the eggs in a medium bowl and whisk together until well-combined. Add the whisked eggs to the pan and scramble the eggs until cooked, about 1 minute. Remove from stove. Prepare your breakfast tacos. Evenly distribute the eggs among the 6 tortillas. Add 1/4 cup steak to each tortilla, then top with avocado slices, diced tomato, cilantro and diced onion. Disclaimer: This post was sponsored by Phil’s Fresh Eggs. Oh yum! 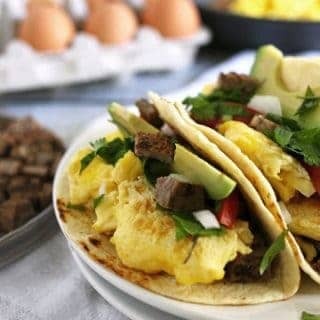 Love the idea of making a steak and egg taco! The look fantastic! 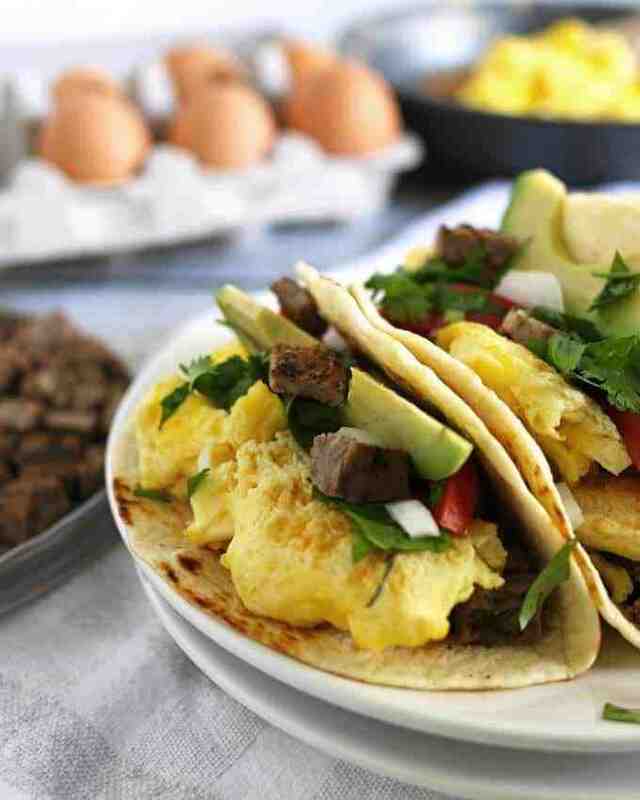 These look like some seriously divine breakfast tacos! Fresh eggs can make all the difference! This looks like one killer breakfast taco – we might be having them tomorrow! Seriously you can not go Wrong with Steak and Eggs!! Then make them into a taco. Genius!! This is such a perfect breakfast dish! I need to make this this weekend! My husband says THANK YOU in advance for his Fathers Day breakfast! This is everything he loves wrapped up in a taco. Perfect! I think I’d like to have this for breakfast for dinner sometime this week! Steak and eggs are a perfect combo! Now this, THIS is breakfast! My hubby is going to go nuts over this. Love it! I need these in my life! This is totally happening for Father’s Day! We love “brinner” (breakfast for dinner) around here, especially on summer nights when Daddy is teaching. Thanks for sharing on Creative K Kids Tasty Tuesdays. THIS DOES SOUND LIKE A QUICK, EASY FATHER’S DAY BREAKFAST IDEA! DADS SHOULD GET BREAKFAST IN BED, TOO, I THINK. 🙂 Thanks for sharing at the Family Joy Linkup! Wow! These look fantastic! I wish I had your yummy breakfast tacos to go with my coffee! Beautiful tacos; they look lovely and that’s a great way to use a bit of leftover steak, too, which can be tricky to incorporate into a dish! Thanks for bringing this by Throwback Thursday!